Happy New Year! I hope 2013 brings you smiles and lots of good eats! 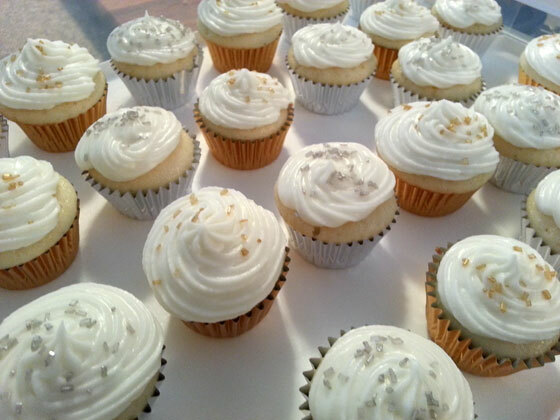 To ring in the new year with friends, I baked these Mini Champagne Cupcakes. I love a good boozy cupcake and thought the champagne twist would be perfect for a celebration. I decided to make them mini so folks could grab a bite at a time instead of committing to a full-sized cupcake while partying. 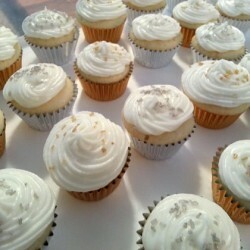 I must say, they are super cute with the silver and gold foil cupcake liners and the matching sprinkles on top! You know I’m not a fan of white cake. I pretty much hate it. There I said it. But these cupcakes are delicious! What? How can this be? Yep, they are mighty tasty. Hey, add champagne and I change my tune. The champagne really makes the batter light and fluffy. You can’t really taste the champagne though, unless you try really hard. If you didn’t know champagne was in the cake and frosting, you’d never notice it. They’re just simple, sweet cupcakes. But aren’t they so darn cute? I loved the coordinating liners and sprinkles on top. These would be great for a wedding as well. I used Korbel brut champagne, which I highly recommend using a dry champagne and not a sweet one as these cupcakes are super sweet. The frosting will make your teeth hurt from the sweetness. They seemed to mellow out a bit on the sweet factor after the frosting set, which I preferred. The mini size was perfect since you can pop them in your mouth. I think a full-size cupcake this sweet would be overkill. I would have liked to have tasted more of the champagne, but as far as cupcakes go, these are pretty great. You could also add a few drops of food coloring to the batter and frosting and make these coordinate with just about any special occasion. 1. Heat oven to 350Â°F (325Â°F for dark or nonstick pan). Place paper baking cups in each cup of a mini muffin tin. 2. In large bowl, mix dry cake mix and champagne. Add oil and egg whites. Beat with electric mixer on medium speed 2 minutes. Divide batter evenly among muffin cups. 3. Bake 9 to 11 minutes or until toothpick inserted in center comes out clean. Cool 5 minutes; remove from pan to cooling rack. Cool completely. 4. In a large bowl beat powdered sugar, butter, and salt with electric mixer on low speed until blended. Beat in 6 tablespoons champagne. If frosting is too thick, beat in more champagne a few drops at a time. Frost cupcakes. Garnish with gold and silver sugar sprinkles.